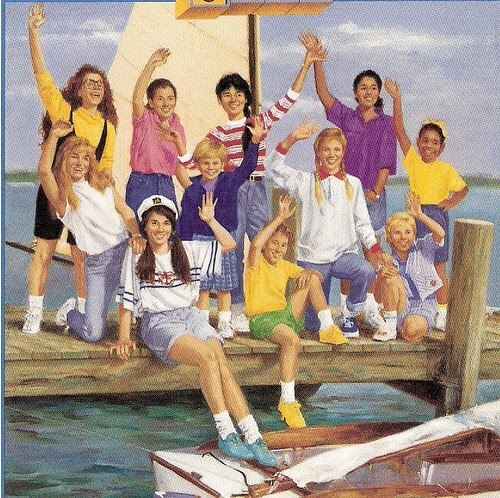 I absolutely adore the book series "The Babysitters Club." This adoration began in first grade after receiving a Scholastic's Book order form...come on you remember those. Your teacher would pass them out once a month, and then you had the opportunity to order books for you take home. Luckily for me, my dad (good 'ol Mike!) let me buy pretty much whatever/how much ever (bad grammar...sue me) I wanted when it came to books. On one hot October day, I received my newest book order form. This is a day that changed my life. In the "Special Order" section, there was an option to sign up for a book club. As a member of this club, not only did you receive 4 new books every two weeks, but you also received several book series related prizes. On this fateful day, the book series that was on special was "The Babysitters Club." The second the first book in the series arrived I was hooked. For several years I was a member of the club and before I knew it I had read/re-read and owned every book in the series. I also owned all of the life-size dolls of each of the original characters (7 in total...this was before Shannon and Abby came into play). As I grew older (at this time I was 9) I became convinced that I should start my own club. With the help of my two neighbors (they were twins and a year younger than me) we created countless posters and fliers and distributed them throughout our neighborhood. We advertised that we would hold a weekly meeting (just like the real "Babysitter's Club") on Monday nights, and during that time parents could reach three babysitters at one time. HOW CONVENIENT!!! We were even smart enough to lie about our age on the posters. I said I was 11 and the twins were 10. Haha...who wouldn't trust us to watch their kids? At 6:00pm (just like the books) our meeting was officially over. We had not received one request for our services, and the next day we took our signs down. Haha, looking back now, I remember being so disappointed. Little did I know that later when I was much older (a more appropriate babysitting age), I would get lots of babysitting jobs. I love taking care of kids, and I actually attribute most of my success as a great babysitter to things I learned from reading "The Babysitter's Club" books. The girls in the club were fun, resourceful, and caring. I still love them to this day! So here's to: Kristy, Mary Anne, Claudia, Stacey, Dawn (my favorite), Mallory, and Jessi. The original members!!! ***I do realize that the actual original four were Kristy, Mary Anne, Claudia and Stacey. They were the four in book number 1. However, Dawn, Mallory, and Jessi all come into the club VERY early in the series. So I consider them original members as well. Abby and Shannon came into the books late in the series...and haha...they didn't have dolls for them. But they are just as important as well! Haha, I love this. Good memories.